Great stories blend structure and experience in their attempt to reach out and connect with another. Story is structure. To embrace this statement is to assume that every moment must propel and communicate an essential story point or thematic message. A well-crafted work walks the line between form and format, sprinkling in the occasional spice to mimic and call to the mind the very chaos of life. In our blog post Understanding Passive, Actual, Structural, and Storytelling Scenes we uncovered four different examples of PASS with four different films. While insightful and varied, pulling from disparate sources failed to show how this concept plays out within the same film. Were they different simply because they were part of a distinct kind of narrative, or is there actually something to this idea of acknowledging the purpose behind the type of scene illustration? Alex Garland’s psycho-techno-thriller Ex Machina provides ample opportunity to explore the various modalities of scene illustration within the same work. A sophisticated narrative that balances structure with pure storytelling, this story of two women and two men getting to know one another in the secluded mountains of Norway excels both in structure and pure entertainment. The final and fourth modality-PASS-finds the Author making the determination how they want to illustrate a particular scene. Structural scenes communicate an essential element of the story’s narrative code. Storytelling scenes impact the Audience’s sense of things, both external and internal. Active scenes set Structure or Telling into motion, while Passive scenes offer static interpretations of the same. An Active Structural scene is one where the story furthers progress of the narrative through Character, Plot, Theme, and Genre. In Ex Machina, look to the scene where Ava informs Caleb what she knows about Nathan. In terms of Plot this scene pulls the story forward with a Story Driver of Action: Ava delivering her message forces Caleb into making a decision between either trusting her or trusting Nathan. The dramatic tension and sinister feeling of dread that completes the scene identifies Genre. Theme finds a place both within the Relationship Story Issue of Interpretation and the Relationship Story Catalyst of Senses. The power cut shuts down and alters sight and sound while simultaneously providing an opportunity for Caleb to misinterpret Ava’s intentions. What he sees as a sign of friendship & trust building is really the first instance of deceit between them. Out of all the modalities of illustration, the Passive Structural seems to be the most difficult one to comprehend. How can a scene communicate structural components, yet somehow not move a story forward? If you’re familiar with Dramatica’s concept of Signposts and Journeys you know that both exist at the same time and in the same place; the former reflects static instances of plot progression, the latter procedural or fluid instances. If you understand Dramatica’s explanation of “character arc”, you know that there are two components: the Main Character Resolve and the Main Character Growth. The first identifies that static instance of the central character’s arc, the latter the shift or movement from one state to the next. Both exist simultaneously and both rely on the other to define the story point in question. It is the same thing as observing light in our universe. Light exists as both a state, and as a process. Binary and analog. Particle and waveform. The scene where Kyoko wakens Caleb is a Passive Structural scene in Ex Machina. Finding Nathan working out, Caleb hits Plot first with his plans for the Turing test. Questioning Nathan’s examination format and comparing it to playing chess against a computer signals the Overall Story Goal of Developing a Plan. The next bit of storyform communicated is Genre. Their discussion surrounding simulation vs. actual delivers Information to the Audience, teaching them the various ways to conduct a Turing test. In the next beat, Nathan brings up Theme by recalling their conversation the day before in regards to how Caleb felt about Ava. This resubmits the Overall Story Issue of Circumstances to the Audience and reminds them of the source of true conflict in the story. And finally, Nathan hits the Character beat by twisting his words from the day before, “The question is…how does she feel about you.” That refers to Caleb’s Main Character Symptom of Desire and clues the Audience in on where Caleb believes his personal issue lies. This scene communicates essential elements of the storyform through Character, Plot, Theme, & Genre. Unlike the Actual Structural scene, this Passive Structural scene delivers this message in snapshot form. Storytelling scenes break a different direction. 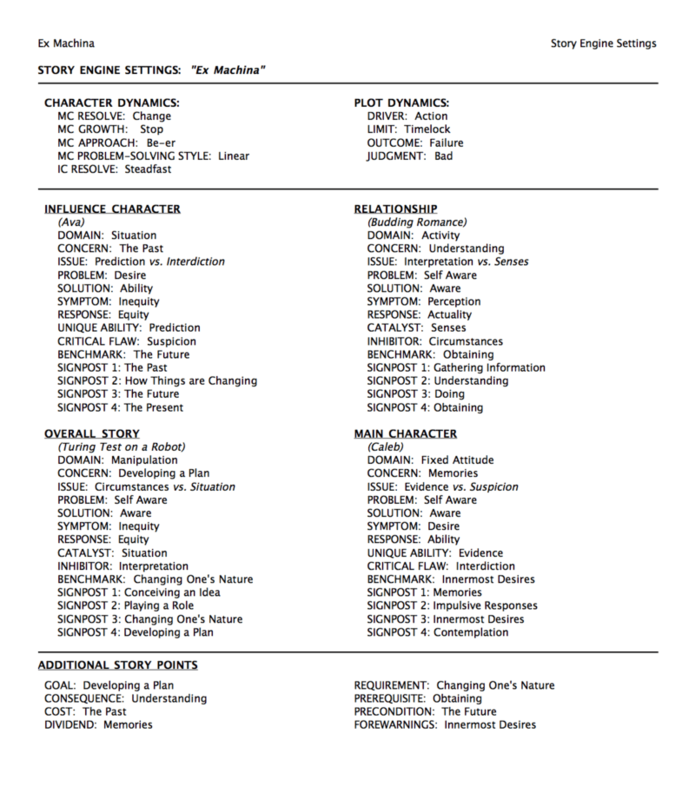 Instead of channeling Character, Plot, Theme, & Genre, these scenes impact or influence the Audience’s sense of a Situation, an Activity, a Fixed Attitude, or a Mentality or Manner of Thinking. The difference between Active and Passive? The former puts these into motion, the latter communicates an instance of storytelling. Analog and Binary. Particle and Waveform. You can’t escape them in the real world. You can’t escape them in story. In Ex Machina, a perfect example of an Active Storytelling scene is the opening helicopter flight to Nathan’s hidden compound. The scene uses its first beat to impact the Audience’s sense of Situation by taking them into a new world. We get to see things most of us have never seen before. It’s beautiful and it creates a sense of awe and a sense of wonder. This is the scene’s second beat: the Audience’s state of mind. The Mentality sense, or Manner of Thinking, beat comes when Caleb asks the helicopter pilot how much longer. The pilot smiles and tells Caleb they have been flying over Nathan’s land for two hours. This beat impacts the Audience’s manner of thinking and manipulates them into a sense of Nathan’s grandeur. And finally, the Activity beat happens when the helicopter lands and Caleb jumps off. This ignites the Audience’s sense of adventure. Caleb, now on his own in this vast and beautiful land, sets out to find Nathan’s compound. Impacting the Audience’s sense of wonder and entertaining them by carrying them off to a brand new Situation, manipulating their manner of thinking and granting them the gift of adventure, this opening sequence draws Caleb—and by proxy, the Audience—into the narrative. In contrast to the Structural Scenes above, this scene does not communicate meaning, it simply tells a story. When I first conceived of this article, this scene was the first one that came to mind. Out of all the modalities of PASS, the scene that can be removed without fear of altering structure or the Audience’s sense of motion is easiest to find. A Passive Storytelling scene impacts the Audience’s sense of things as a static moment within the story. The overall purpose of the illustration is to entertain, humorize, dramatize, or inform the Audience in a one-off. Get in, get out—give flavor to the story, yet don’t overpower. Apparently, being born with the innate skills to build a multi-billion dollar tech company and create the world’s first fully-functional and convincing artificial intelligence also makes someone one helluva a great disco dancer. The scene where Nathan dims the lights and dances with slave Kyoko is both entertaining, humorous, and scary as all Hell. Yet, it does nothing in terms of communicating the storyform or furthering the narrative. The first beat finds Caleb caught in a precarious Situation attending to Kyoko’s blouse. Nathan enters to address that potential for conflict and instead of getting mad, attempts to manipulate Caleb into dancing with Kyoko. Even Kyoko herself tries to convince Caleb to get down in this second beat that addresses the Audience’s Manner of Thinking. Disregarding Caleb’s wallflower nature, both Kyoko and Nathan begin disco dancing—an Activity that engages the Audience into appreciating their formidable skills. The scene ends on Caleb’s face—his shock and bewilderment our shock and bewilderment, mixed with terror and amusement—our state of mind forever changed by this last and important beat. Story is structure, yet structure is not story. Audiences do not attend screenings, or plays, or sit down to read a good structure. They want to experience a great story. Effective structure is important as it acts as the carrier wave for the Author’s Intent, or thematic purpose. The more solid the structure, the clearer the message. The clearer the storyform, the greater the chance for the Author to impact and influence the Audience. Suspicions grow if a work simply implants a message. Audiences feel the manipulation and begin to grow wary of the entire experience. Like Caleb they want to fall in love—but after being burned so many times before by Authors and filmmakers they trusted, they want to believe there is more than intent. They want new situations, new activities, a greater state of mind, and a challenging and welcome playground to process it all. They want a story that reflects life with all its ups and downs and chaotic interludes. And they want a life inspired and influenced by a great story. By infusing both life and story with intent and experience the Author transcends both particle and waveform to say a little something about what it means to be alive. And hopefully there is someone out there to hear what is being said.